The Italian artist who created this masterpiece was as Tiziano Vecelli, or Titian, was one of the most influential painters of the Italian Renaissance. Titian was inspired by Raphael, and the passion portrayed in this famous painting was a breakthrough in religious artwork at the time it was created. 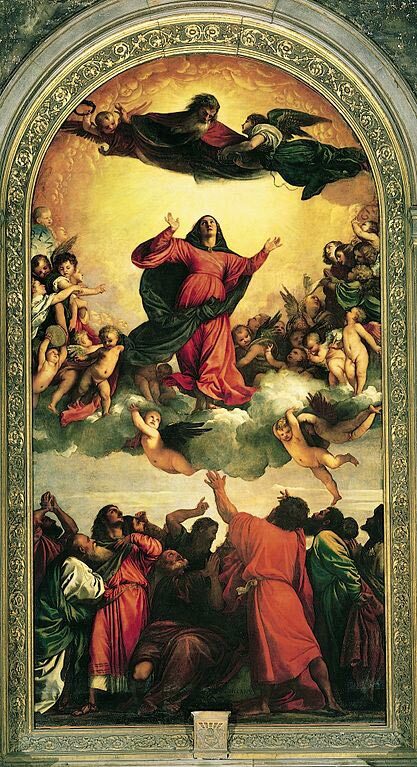 The Assumption of the Virgin is characteristic of the tendency towards vivid colors with luminous qualities that Titian favored in the earlier part of his artistic career. Later in life, however, his style evolved to favor subtler shades of color and highly lifelike shadowing. The paints used by Titian were composed of gum turpentine and linseed oil, among other unknown ingredients. Titian’s brush strokes were heavily loaded with color to create a high visual impact on the viewer. The composition of the painting is brilliantly designed to lead the eyes upwards in a pyramid shape, beginning with the red robed apostles at the bottom, to Mary’s red dress, and finally to the red tunic of God himself at the top. Painted in bold and highly contrasting colors, the Assumption of the Virgin oil painting depicts the miraculous raising of Mary, mother of Jesus, into heaven. Bidding her farewell on the ground below are the apostles, who reach up towards Mary’s figure as it’s lifted up by angelic cherubs amidst the clouds. The elderly, male personification of God peers down at Mary from the golden light of heaven as an angel beside him carries a crown to present to Mary. The entire painting stands at twenty two feet high, and it is said to be the most famous painting of Mary’s assumption that was ever created. This religious scene commemorates the assumption of Mary which is celebrated annually within the Catholic Church, and it was painted as the first popular commissioned work of Titian for the city of Venice between 1516 and 1518. The painting still stands in the same place that it was originally created for: the altar of Santa Maria Gloriosa dei Frari Basilica. I do enjoy the manner in which you have presented this particular situation plus it does offer me a lot of fodder for consideration. On the other hand, through everything that I have personally seen, I just wish when the actual feedback pile on that folks stay on point and in no way get started on a soap box regarding some other news du jour. All the same, thank you for this fantastic piece and whilst I can not really concur with the idea in totality, I regard your point of view.